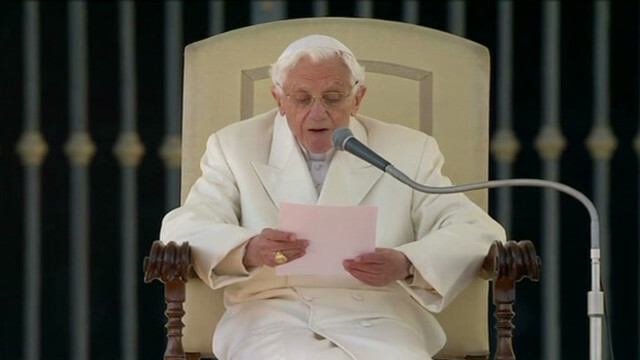 • Pope Benedict XVI speaks in final papal audience: "In front of rapt crowds, Pope Benedict XVI spoke of moments of struggle as well as joy Wednesday during his final public address from a stage set up in St. Peter's Square." • Spending cuts are about to get weird: "Starting Friday, federal agencies will be forced to make cuts to their programs without knowing what their actual budgets for this year will be. Why? Because Congress never passed a budget, just a stopgap funding measure that expires soon." • Chuck Hagel sworn in as defense secretary: "Chuck Hagel, the former Republican senator from Nebraska, was sworn in as secretary of defense Wednesday after a bruising nomination fight." • Snowstorm loses steam, but still packs punch: "While residents in Kansas and other Plains and Midwest states still had tons of wet, heavy snow to clean up, and some remained without power, the storm that had socked some places with more than a foot of snow had moved on." • Yahoo work-from-home policy riles workers everywhere: "The change, announced Monday by Yahoo human resources chief Jackie Reses, is expected to affect hundreds of employees. It is one of many changes CEO Marissa Mayer has made since being hired last July." I really wish you folks would just tell the news. Real news like all those illegal alien prisoners being released. Instead I hear stupid discussions about why republicans aren't behind that thug Chris Christy. Are you so restricted to not saying anything that could hurt the democrats that that you just don't have any news left to tell. Get off the republican bias and just tell the real news. We might start watching you again. Piers Morgan doesn't have a leg to stand on with his gun regulation crap. Why doesn't he go back to his country instead of trying to change ours. During his last speech, a man was arrested for throwing eggs at the Pope. His defense was that we was simply trying to make eggs Benedict. He was released without incident.